The Monday EA trades on Mondays depending on price movement on Fridays. 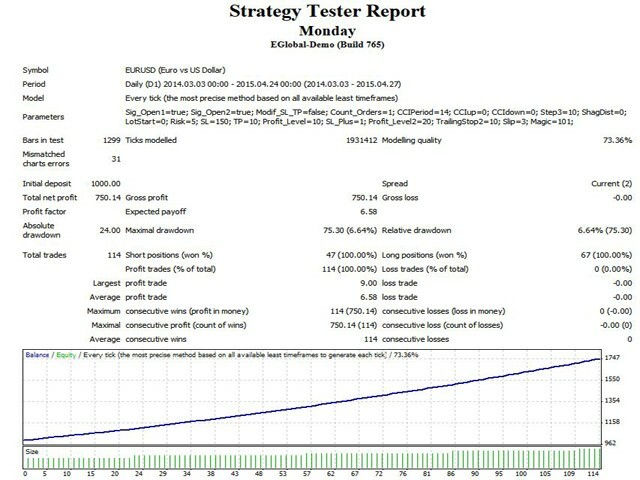 Its aim is to take 10-20 points of profit and leave the market. This strategy works from March 2014. Currency pairs are EUR/USD and GBP/USD. Sig_Open2 = true; - enable only on EUR/USD (works only on EUR/USD). If the CCI indicator crosses the CCIup value from the bottom upwards on the current daily candle, a buy order with predefined stop loss and take profit is opened. If the CCI indicator crosses the CCIdowm value downwards on the current daily candle, a sell order with predefined stop loss and take profit is opened. When the order is opened, the EA remembers that there is the opened order on the current candle and it will not open other orders there. Modif_SL_TP = false; - set to true, only if you cannot set stop loss and take profit for the given order due to broker's account type. 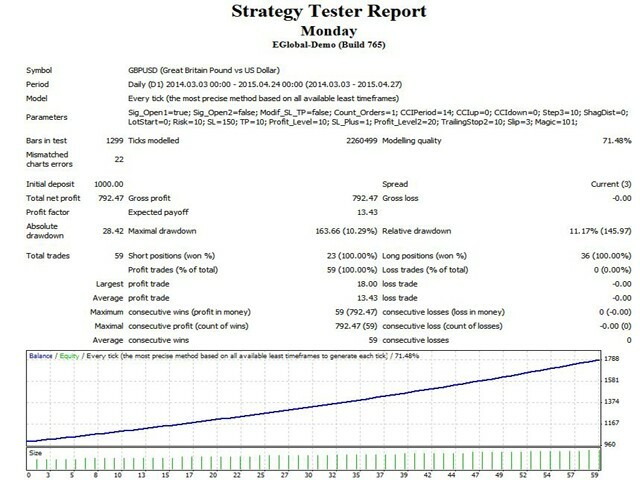 If set to true, the EA will place the order by a signal without take profit and stop loss. 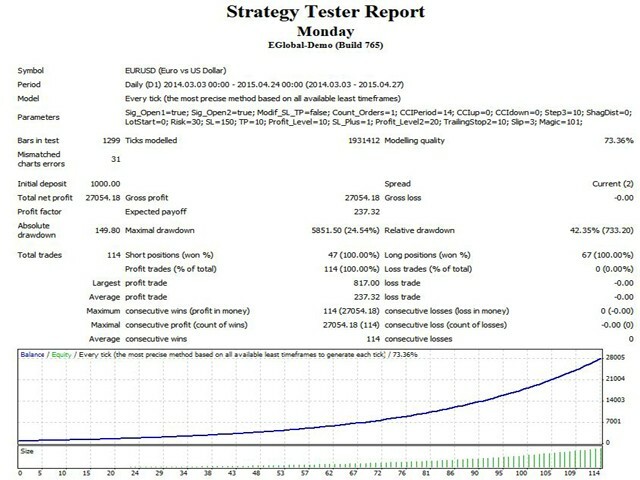 After this it will separately modify stop loss and take profit on the following tick. 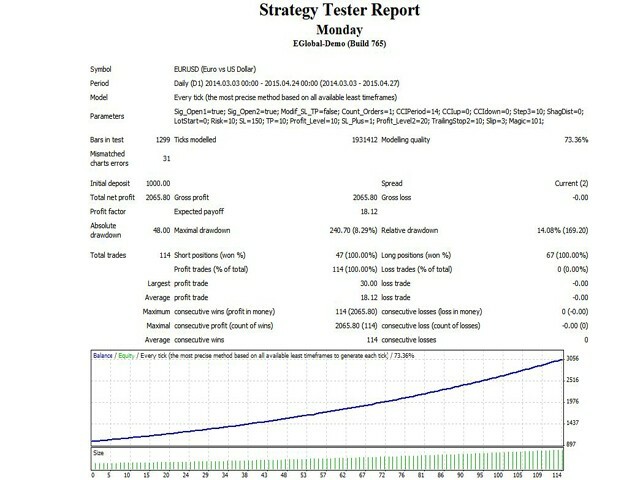 Risk=20; - if LotStart=0, lot is calculated according to percentage ratio of the deposit. Example: each 10 percents represent 0.01 lot per each 100 units of the deposit base currency. The EA also considers lot of the last closed order with the EA's Magic number: if calculated lot is smaller than the last closed order, the next order lot will be equal to the last closed order lot. If calculated lot is bigger than the last closed order, the next order lot will be equal to calculated lot. This is necessary in case that a user is going to trade aggressively. Profit_Level = 10; - if the order has profit of the stated number of points. Profit_Level2=20; - if the order has profit of the stated number of points.